It doesn&apos;t matter which town or city you stop into in Manitoba - chances are, there&apos;s a museum of unusual oddities and vintage trinkets just waiting to be discovered. 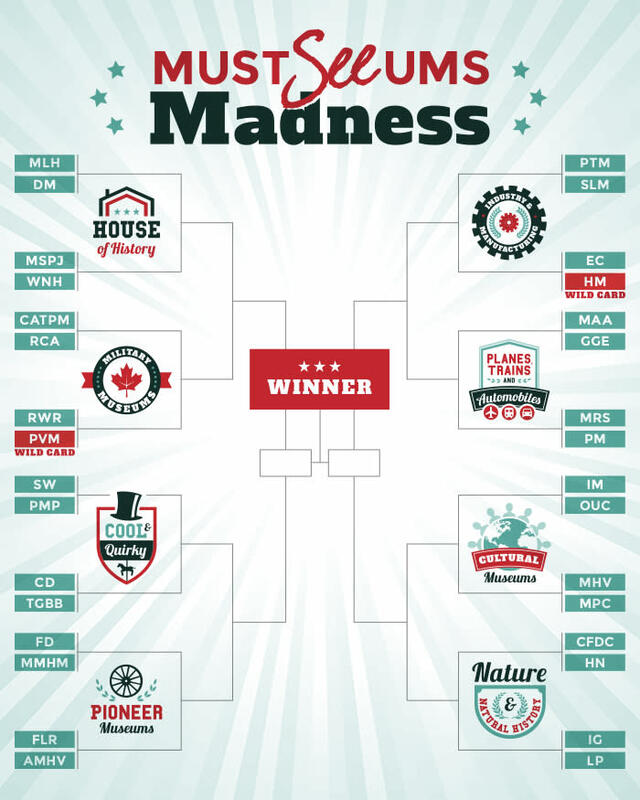 This year&apos;s rendition of March Madness focuses on just that - our Manitoba Must-See-Ums - small to medium cultural attraction or museum that you simply can&apos;t miss. Vote for your absolute favourite hometown museum or root for one that&apos;s on your list to visit - it&apos;s up to you! The winner will receive a free promotional video courtesy of Travel Manitoba! Our competition starts close to home with our House of History category pitting one homestead against another. The Margaret Laurence House (Neepawa) will attempt to overthrow the Victorian behemoth that is the Dalnavert Museum (Winnipeg), and you won&apos;t be able to look away as another battle starts up between Francophone favourite Le Musée de St. Pierre and the Ukrainian-style Wasyl Negrych Pioneer Homestead (Gilbert Plains). On the Industrial and Manufacturing side of history, the Pembina Thresherman&apos;s Museum (Winkler) will use the power of machine against the underground might of the Snow Lake Mining Museum. Eriksdale Creamery Museum will see if they can indeed cream the competition and wildcard choice*, Pioneer Village Museum (Beausejour). Military museums that honour our history in global war will see the Commonwealth Air Training Museum (Brandon) take on the RCA Museum (Shilo), while wildcard choice*, Hillcrest Museum (Souris) sneaks in to take on the Regimental Museum - The Royal Winnipeg Rifles. Next up, we take a tour with Planes, Trains and Automobiles as the Manitoba Antique Automobile Museum (Elkhorn) uses its antique flair against a new player on the scene: The Gimli Glider Exhibit. This all happens as the Miami Railway Station Museum attempts outrace and outlive the Cleggs Museum of Horsedrawn Vehicles (located within the Prairie Mountain Regional Museum in Shoal Lake). In the Cool & Quirky division we see if Philips Magical Paradise (Giroux) can perform a trick of the eye on the oddities of the Sam Waller Museum (The Pas), while the Carousels & Dolls Doll Museum (Brandon) pits its (sometimes eerie) whimsy against the surreal structures of the Treherne Glass Bottle Buildings. In our Cultural Museums category, we see our northern-most museum, the Itsanitaq Museum (Churchill), take on the Oseredok Ukrainian Cultural and Educational Centre (Winnipeg) as the Mennonite Heritage Village (Steinbach) is up against Le Musée des Pionniers et des Chanoinesses (Notre Dame de Lourdes). Meanwhile, it&apos;s an all-out pioneer brawl as Fort Dauphin Museum tries to outwork the Minnedosa Museum & Heritage Village via ox and plough, all while the quaint village of Fort la Reine (Portage la Prairie) faces off against Arborg Multicultural Heritage Village. Last, forces of nature go head to head as the extinct marine reptiles of the Canadian Fossil Discovery Centre (Morden) face off against the wild boreals of the Heritage North Museum (Thompson). And you&apos;ll want to keep your eyes peeled as the Living Prairie Museum (Winnipeg) tries to sneak through tall grasses past the wild terrain of the Irvin Goodo International Wildlife Museum (Boissevain). Ready to vote? Let&apos;s go! The next round starts March 15.